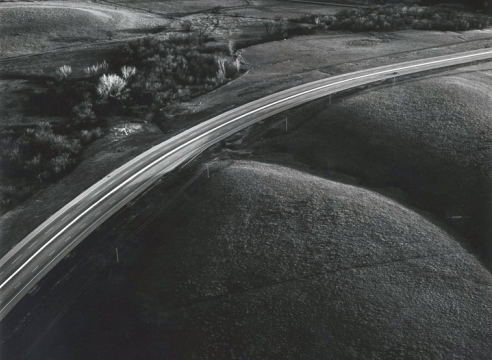 Interstate 35 intersecting the Flint Hills, Kansas, April, 1994. Vintage gelatin silver print, image size 15 x 14 7/8 inches. Abandoned Farmhouse, Saline County, Kansas, August 23, 1990. Vintage gelatin silver print, image size 15 x 14 7/8 inches. Deer Grazing on New Winter Wheat, Saline County, Kansas, March, 1990. Vintage gelatin silver print, image size 15 x 14 7/8 inches. East of Matfield Green, Chase County, Kansas, 1994. Vintage gelatin silver print, image size 15 x 14 7/8 inches. Flood Control Dike, Salina, Kansas, March 11, 1993. Vintage gelatin silver print, image size 15 x 14 7/8 inches. Pond and Car, West of Minneapolis, Ottawa County, April 27, 1990. Vintage gelatin silver print, image size 15 x 14 7/8 inches. Ponds and Sky, Western Saline County, Kansas, May 8, 1991. Vintage gelatin silver print, image size 15 x 14 7/8 inches. Rose Hill Cemetary, McPherson County, Kansas, February 19, 1993. Vintage gelatin silver print, image size 15 x 14 7/8 inches. Smoky Valley (Native American) Village Site Circa 1000-1500 AD, Saline County, Kansas, April 30, 1992. Vintage gelatin silver print, image size 15 x 14 7/8 inches. Smoky Hill Weapon Range: Tires, September 30, 1990. Vintage gelatin silver print, image size 15 x 14 7/8 inches. Concurrently on view in the gallery’s project room is Inhabited Prairie, a selection of vintage black and white aerial photographs by Terry Evans. Taken between 1990 and 1994, the works explore the complexities and contradictions in America’s heartland, and specifically the artistʼs local landscape in her native Kansas. Richly toned and precisely detailed, Evansʼ aerial views possess a rigorous formalism. They are starkly beautiful visual records that take an objective and sensitive stance toward the relationship between land and people. Combining both aerial and ground photography, Terry Evans (b. 1944) has photographed the prairies and plains of North America and the urban prairie of Chicago since the mid-1970s. She has exhibited widely, including solo shows at the Art Institute of Chicago, the Smithsonian National Museum of Natural History and the Nelson-Atkins Museum of Art in Kansas City. She is a Guggenheim Fellow and a recipient of an Anonymous Was a Woman award. Several books have been published on her work including Prairie: Images of Ground and Sky, The Inhabited Prairie, Disarming the Prairie and Heartland. Her work is in major museum collections including the Art Institute of Chicago, Museum of Modern Art, N.Y., San Francisco Museum of Modern Art, Smithsonian American Art Museum, Whitney Museum of American Art, Corcoran Gallery of Art, and the Museum of Contemporary Photography, among many others.